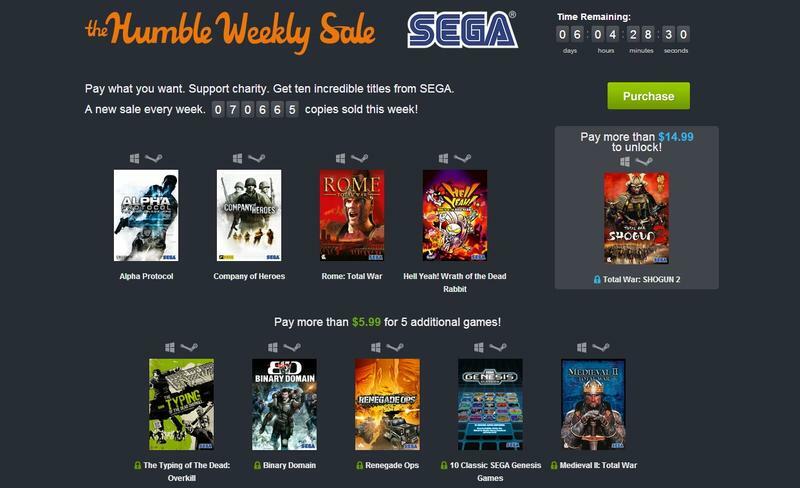 This week's Humble Weekly Sale comes from none other than SEGA. The titles are all for the PC platform and Steam. The pay what you want side of the bundle features four solid games: Alpha Protocol, Company of Heroes, Rome: Total War and Hell Yeah! Wrath of the Dead Rabbit. Paying $5.99 or more will land you Medieval II: Total War, The Typing of The Dead: Overkill, Binary Domain and Renegade Ops. As for the aging games? This bundle includes 10 classic SEGA Genesis games on Steam. The games themselves make up an exceptional list. Here we go. Between all the Golden Axe titles and Vectorman, I don't even know how to handle myself. And the crazy part is that this is only one of the offerings in the bundle. If you break or meet $5.99, you get everything we've mentioned so far. If you pay at least $14.99, you also get Total War: SHOGUN 2. As always, this bundle will let you split your pile paid between SEGA, the Humble Bundle team and charity. The charities this time around are Make-A-Wish Foundation, Special Effect, GamesAid, Whale & Dolphin Conservation and Willow Foundation.